Happy Halloween Fellow Dog Lovers! 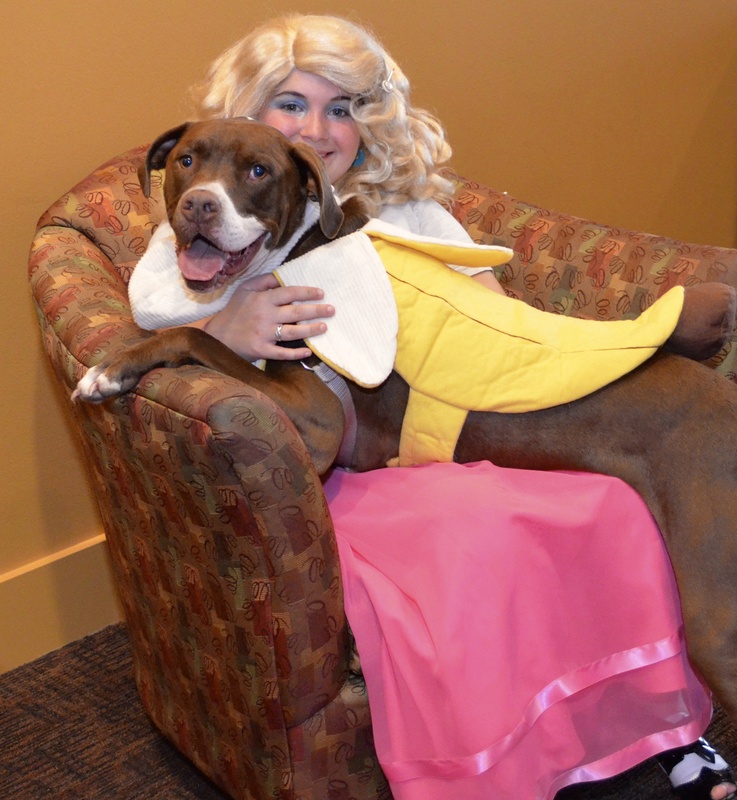 Last Saturday evening was the annual Willamette Humane Society’s Bowser’s Boo Bash, our biggest fundraiser of the year. There was a great turnout and tons of fun. I went as a purple crayon, thinking that was quite appropriate for a retired elementary teacher. I took lots of pictures and picked out a few for the following slideshow. 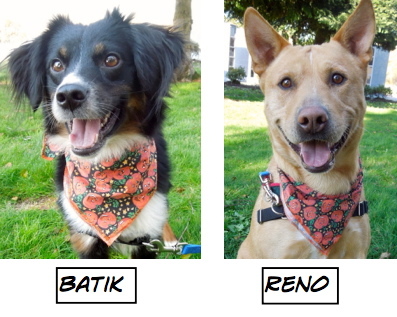 Here are the Blog Dogs who were adopted during the last week. I was especially excited about Jersey finding her forever home. She’s been waiting since last July. 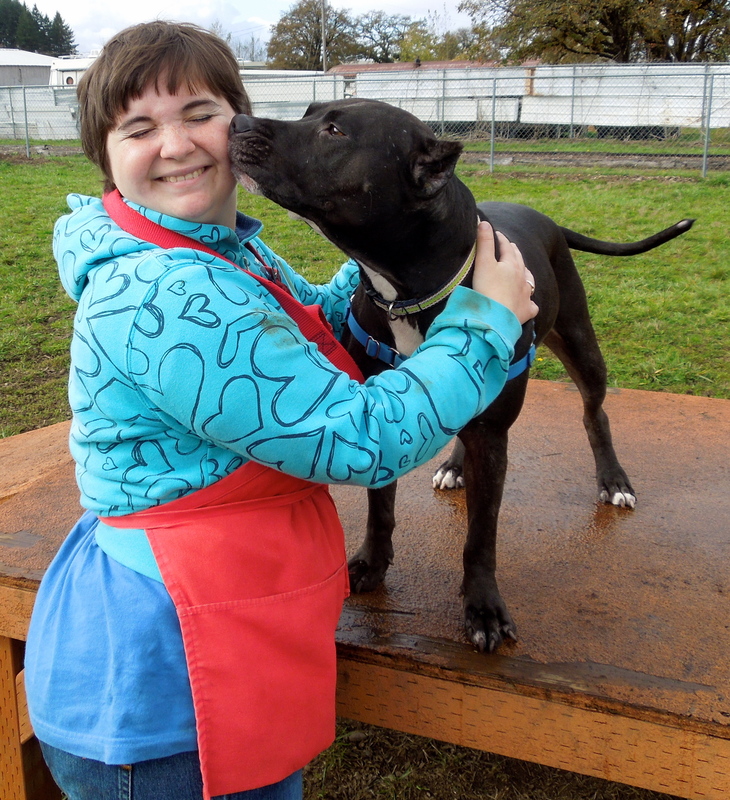 Staff member Janie sent me this picture of Jersey and her new person. She is one lucky dog with lots of room at her new home. She’s the only pet and will get all of the love and attention she deserves! Have a great life, sweet Jersey! 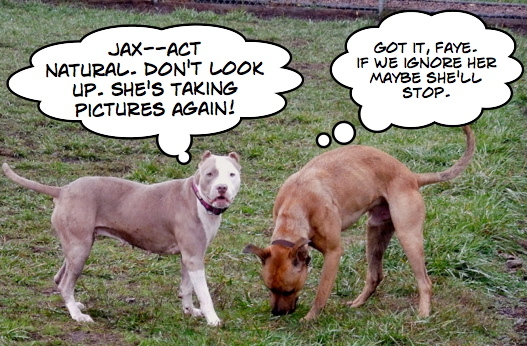 Jax and Faye have become “long termers” at the shelter. 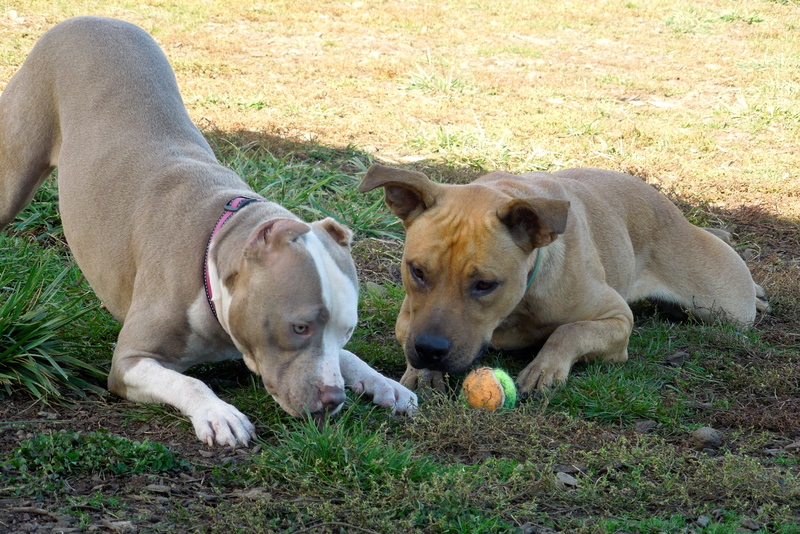 They are Pit Bull Terrier mixes, and both are about two years old. 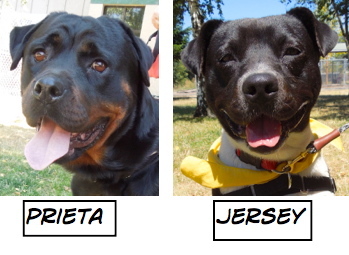 They are volunteer and staff favorites. They have lots of energy and are waiting for families who will give them the attention and continued training that they need and want. Newbie Endo loved play group but found the humans a tad confusing. 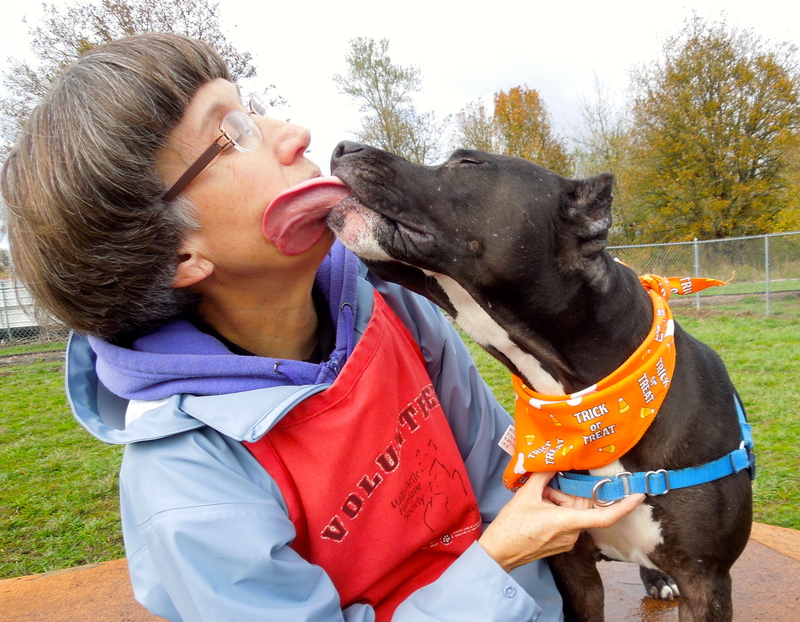 Volunteer Sherrie was playing with Jax and Faye for awhile. 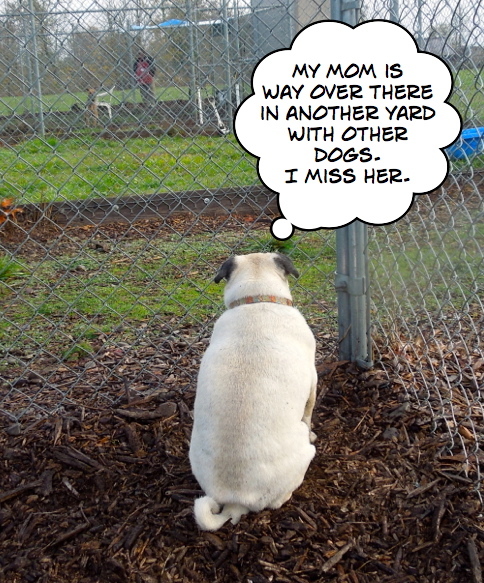 I happened to see Harley (Sherrie’s Pug) sitting forlornly in the corner of the yard. 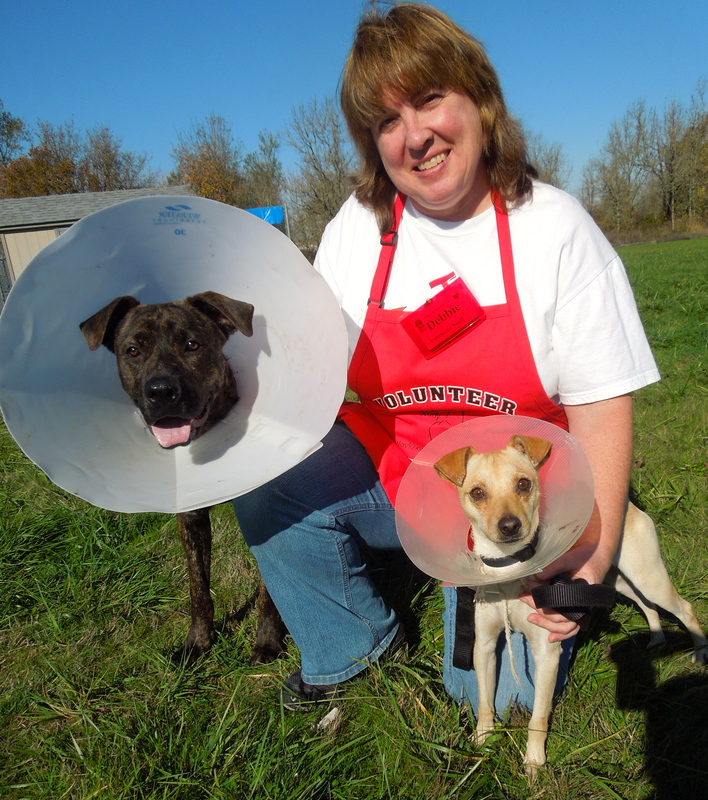 Major and Minor are a bonded pair who need to go home together. They are such a comical duo. Today Debbie and I took them out first. The pictures tell all. Can you tell which one is which? 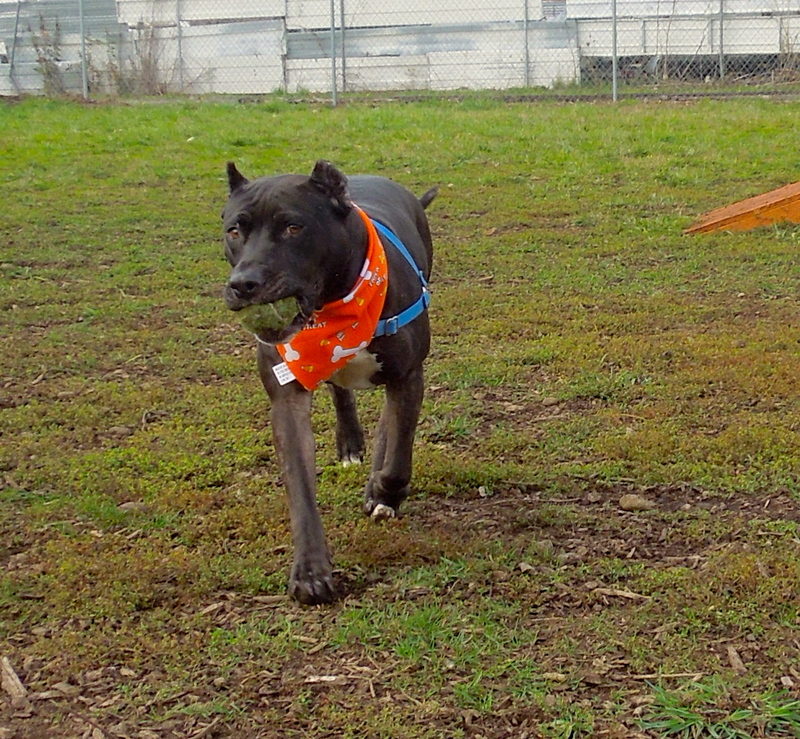 Major is a two-year-old Shepherd mix and Minor is a two-year-old Terrier mix. 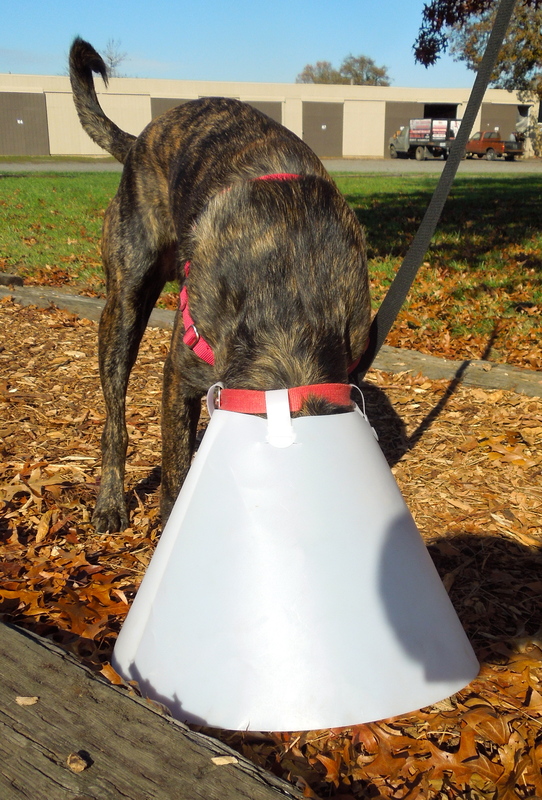 Major has settled down a lot since first arriving at WHS and today walked very well on leash and was happy to pose for pictures, even with a cone. 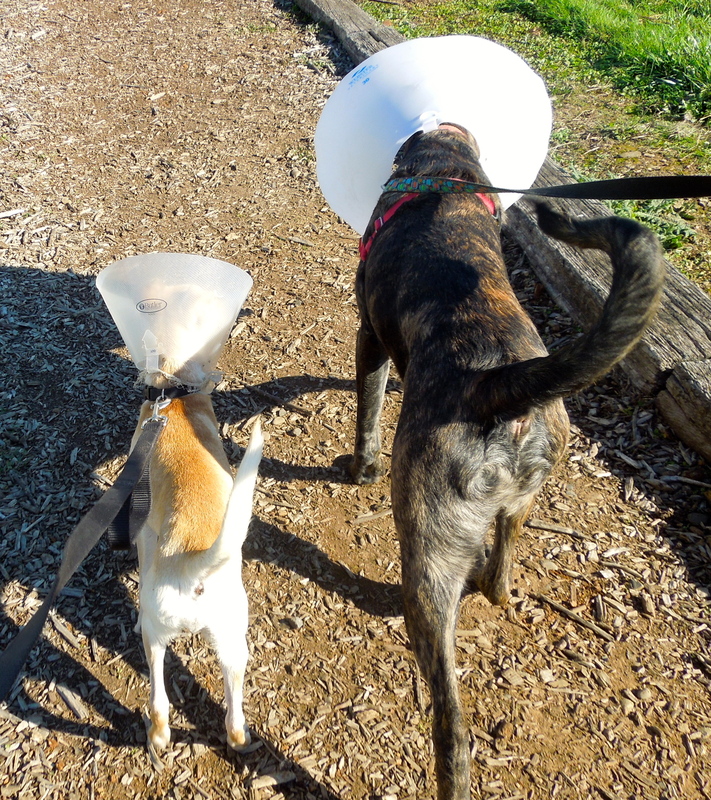 Neither one seemed to be too concerned about wearing a cone after being neutered. They are both house-trained, take treats politely, and are terrific boys. 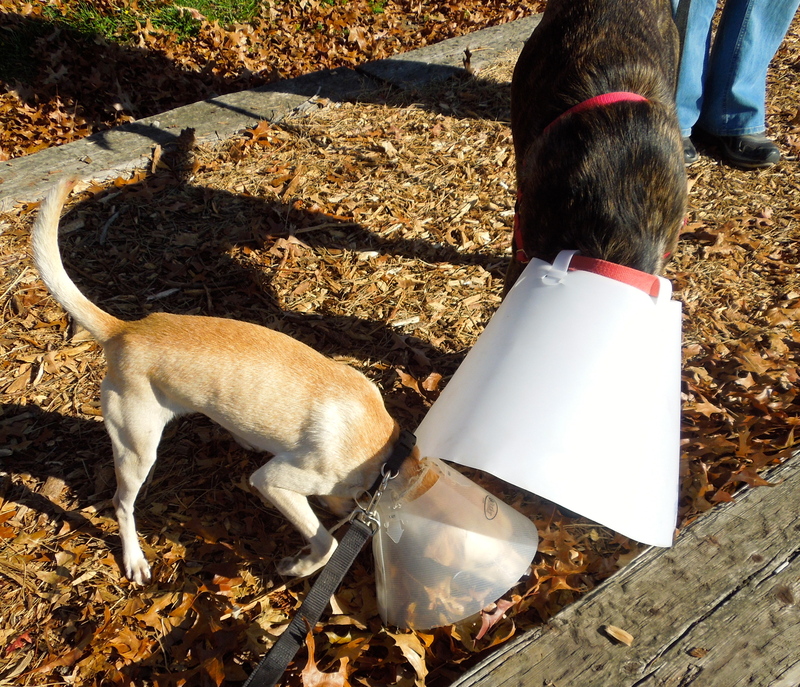 Neither dog let the pesky cones deter them from checking out smells! And this is what they look like! We’re back…it turns out we need a very secure fence. 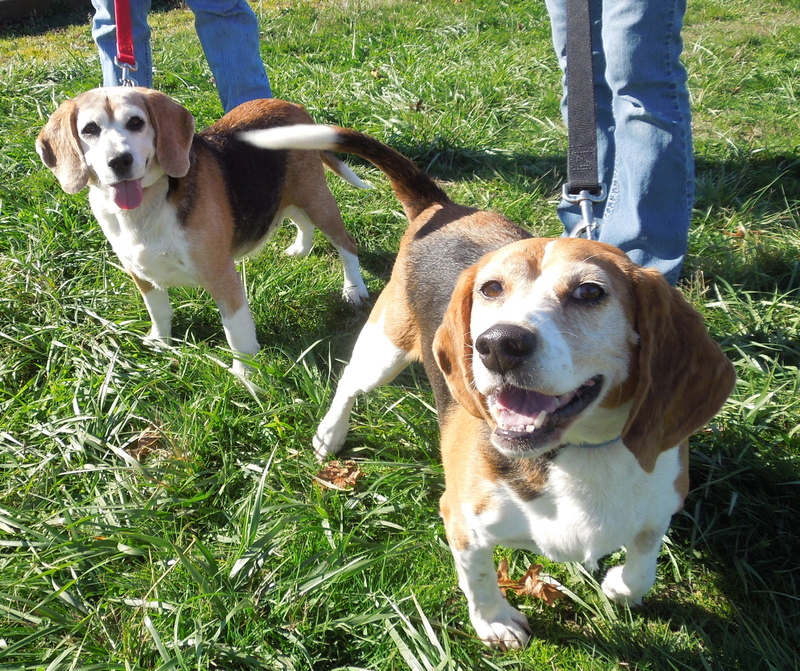 Tara and Hunter were adopted last week, but being true to their breed (they’re Beagles, after all, and love to go on adventures) they slipped under the fence. 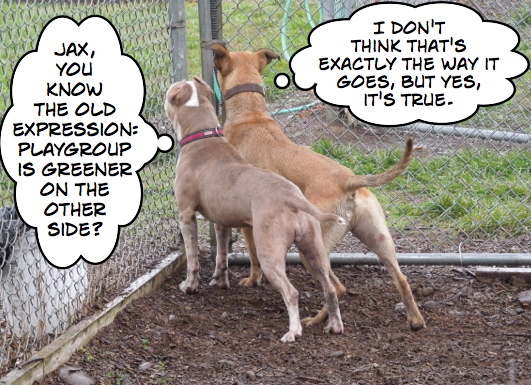 Their next adopter will need to have a VERY secure yard. 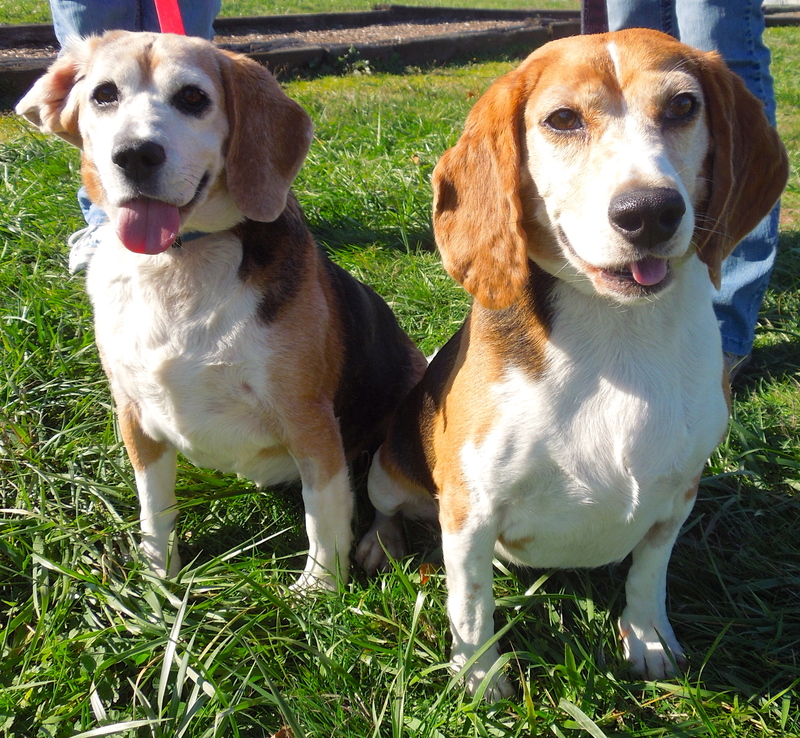 But these two bonded 9- and 8-year-olds are worth the effort to keep them at home. 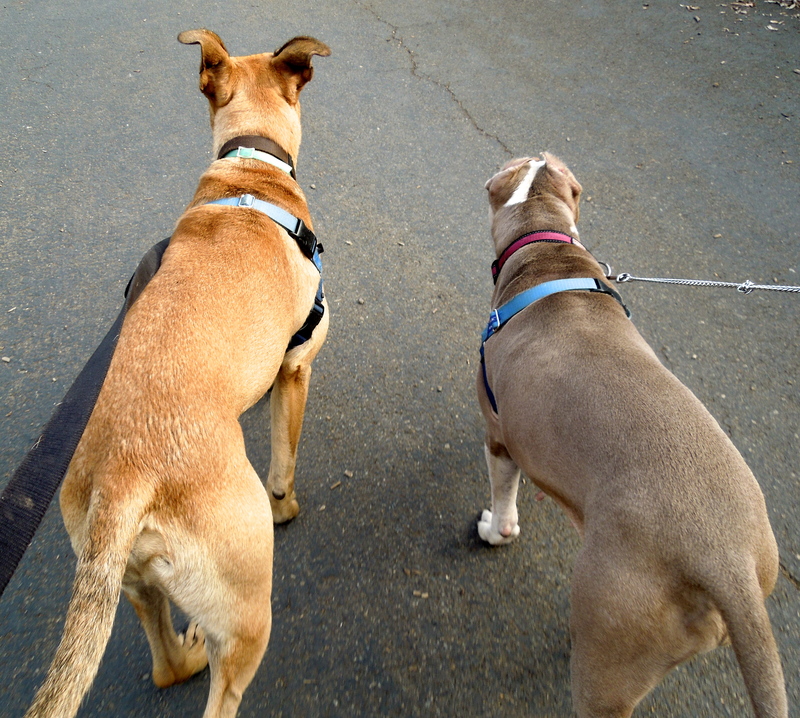 They love to go for walks, are active and happy. 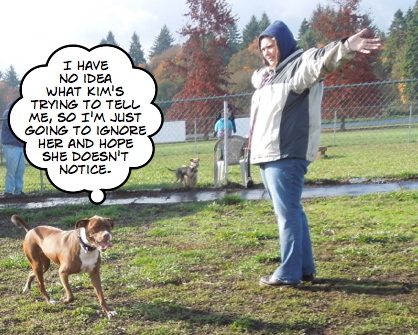 Today Kathy and Angie enjoyed some relaxing time with these characters. 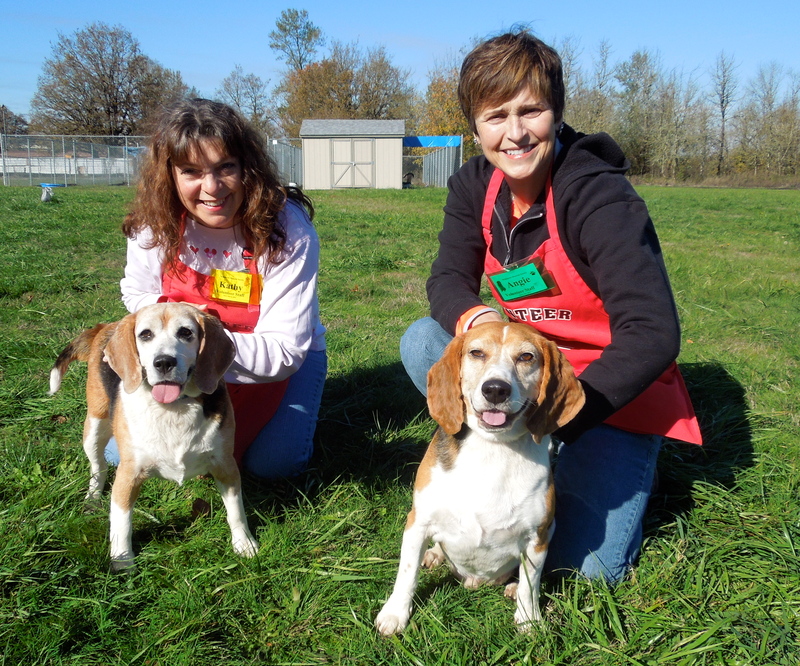 There must be a Beagle person out there who will be the perfect fit for slightly older, but still full-of-life Beagles. Yes, I really am as cute as this picture of me! I met Kewpie for the first time today and instantly fell in love with her. 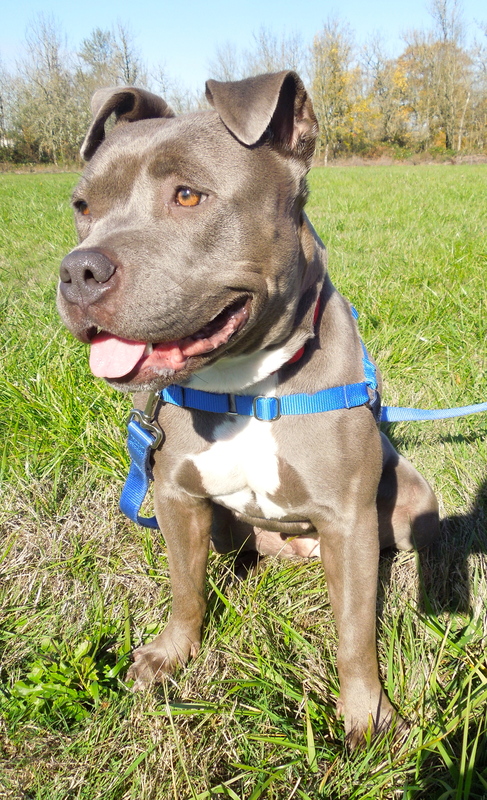 She is a two-year-old Pit Bull Terrier mix who will make such a lovely new family member. She is house-trained, loves to go for car rides, walks very well on leash, is not possessive of toys, knows basic commands and is long past the chewing stage. When offered treats, she sat immediately and took them gently. 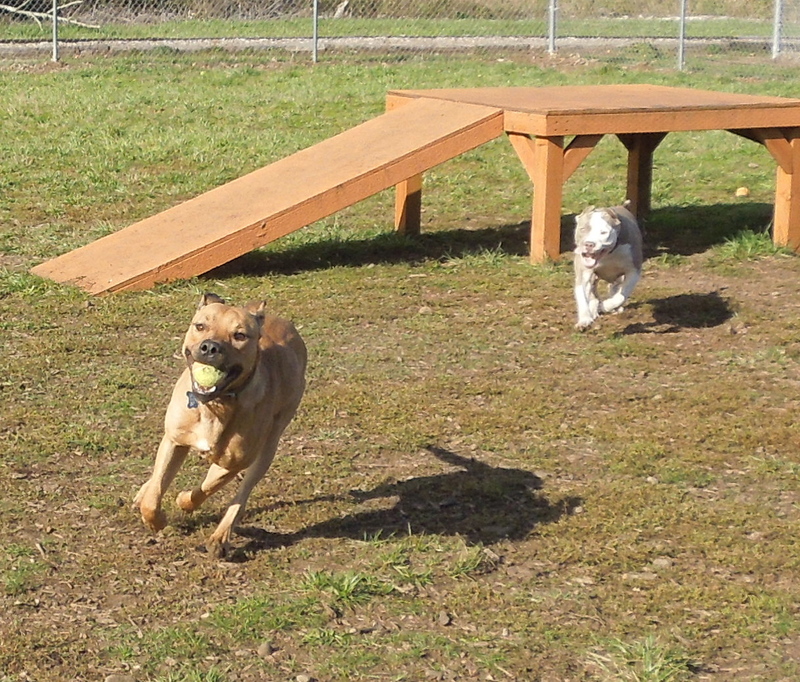 Joan reported that Kewpie loves to play fetch and returned the tennis ball to her. What a sweetheart! I’m hoping she’ll be adopted into her forever home very soon! Kewpie loved being outside watching the activity. A little later I walked past her kennel. She was just sitting patiently, waiting to be adopted. Patrick spent a lot of time brushing me today. I really like him! 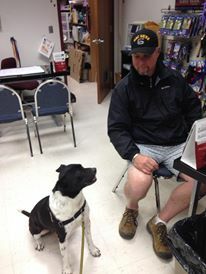 Volunteer Patrick loves to spend time with dogs who are overlooked by potential adopters. Spanky is one of those dogs. 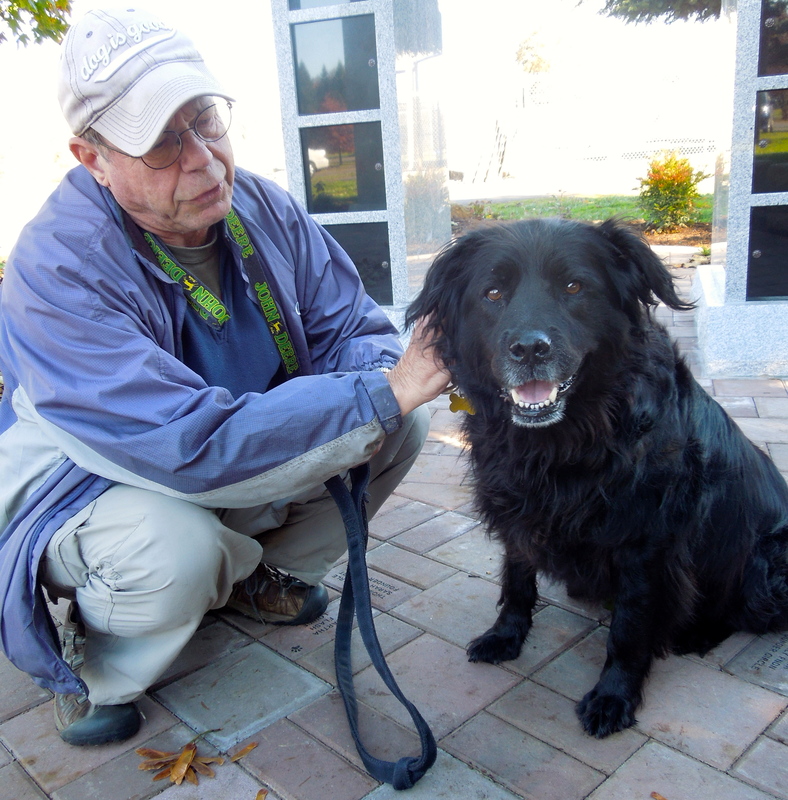 He is a nine-year-old Retriever mix. Yesterday Patrick gave him a bath and told me Spanky was perfectly behaved. Today Patrick spent a long time brushing Spanky’s coat until it shone! 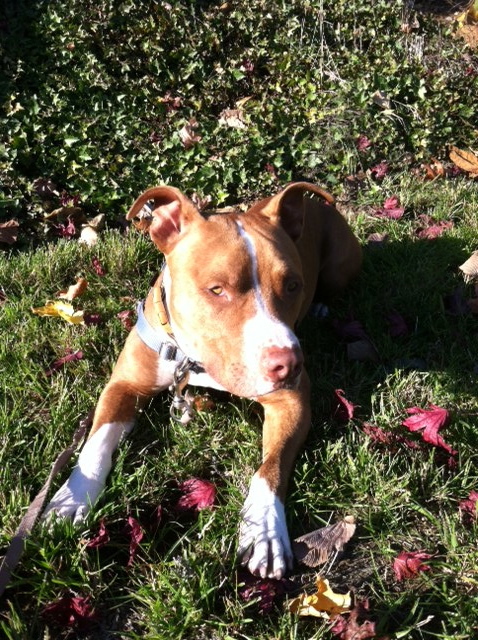 Spanky came to us last August from another shelter and was in a foster home until recently. He will need a home without cats, as he likes to chase them. He took my treats politely and Patrick said he walks very well on leash. We’re hoping his perfect family will find him soon. I was a star at Bowser’s Boo Bash! 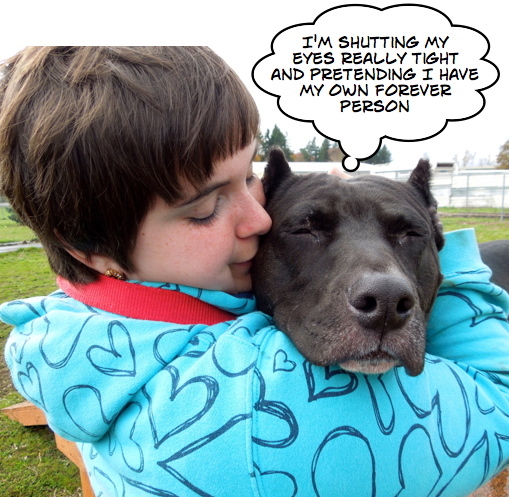 Volunteer Sarah brought Endo to Bowser’s on Saturday night and we both could not have been more pleased with his behavior the entire evening. 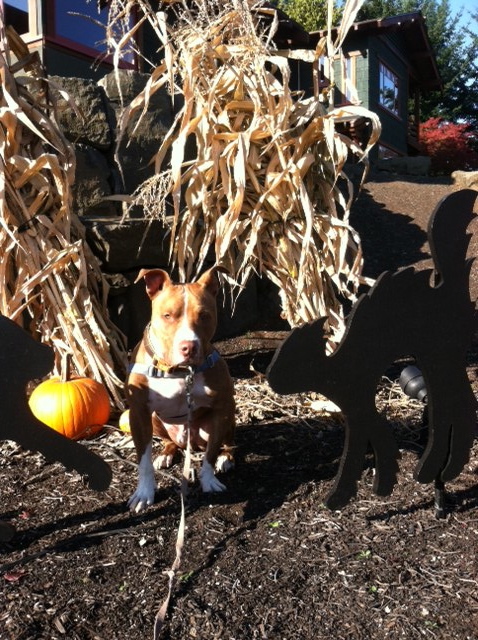 Endo is a three-year-old Pit Bull Terrier. He was perfect in the car and waited patiently alone in it when Sarah picked me up at home. He didn’t even mind being dressed as a banana! He greeted people politely and even with all of the noise and activity at the Bash, he stayed calm and quiet. Sarah took him home for an overnight respite and reported he is completely house-trained and was a very polite guest. 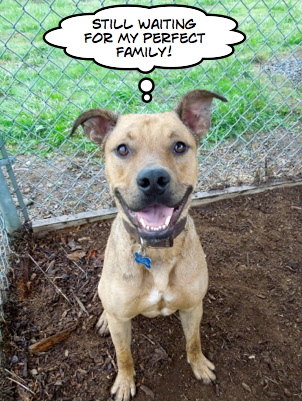 This boy will make some lucky family a wonderful companion. 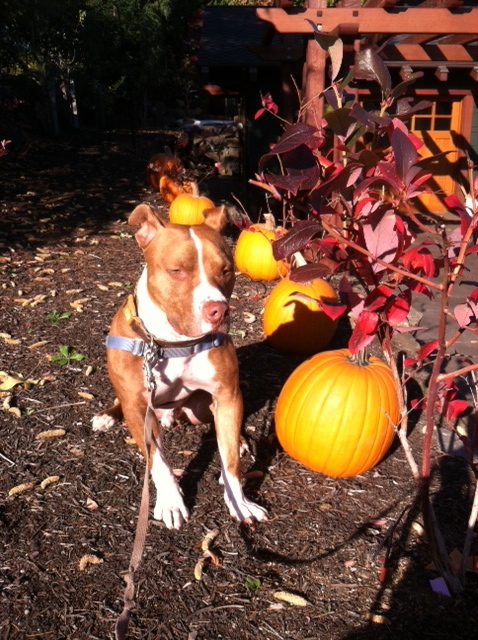 Emma continues to wait for her forever family. 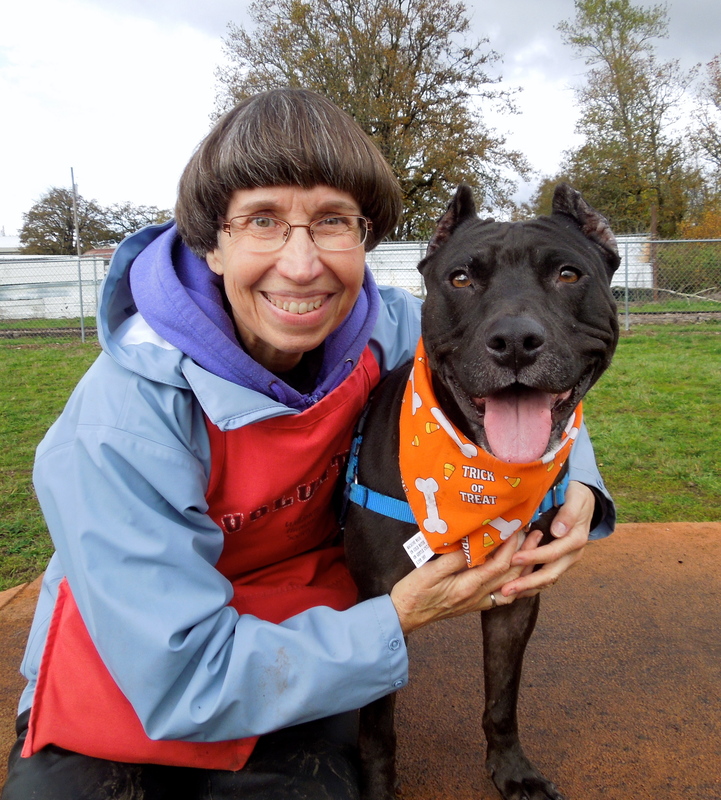 If you read my posts regularly, you know that Emma was rescued off the streets in California, spent four months in a shelter there, then became a S.T.A.R.T.-transported dog and arrived at WHS on September 13th. She has a devoted fan club in California who check in with me about her regularly. 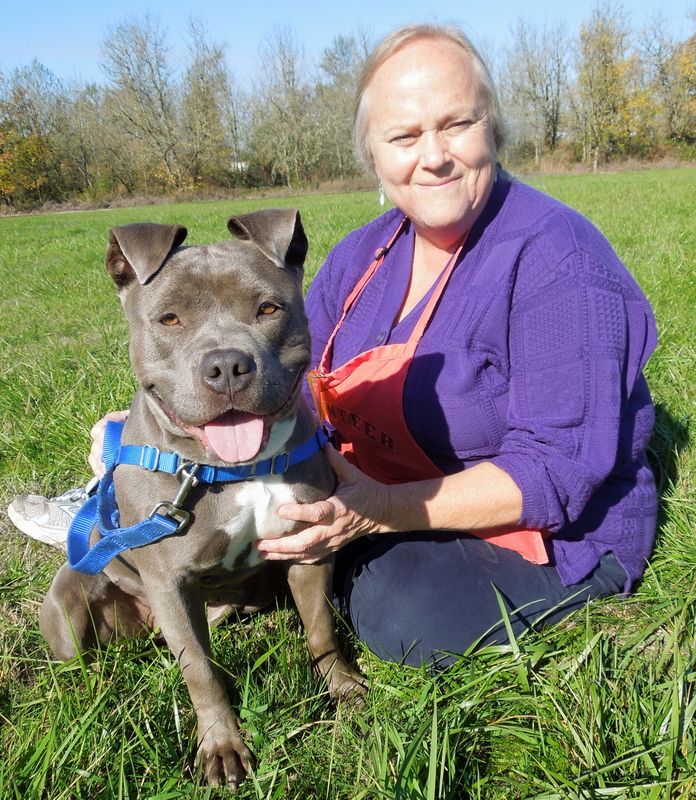 When she first arrived in Oregon, she was timid and nervous, always looking worried. But with love of staff and volunteers, Emma has relaxed. Sarah and I spent some quality time with her on Sunday afternoon. She will need to go to a home without small dogs, but will do fine with a dog her own size or bigger. She has become one of my most favorite dogs ever. Here are some pictures from our afternoon. Gilbert‘s foster mom sent some new pictures for this week’s post. He continues to wait for his forever people at volunteer Jolene’s house. He is another one of my all-time favorite dogs who will make the perfect addition for the right family. He has come such a long way since he first arrived at WHS as an injured stray last December. He has learned to walk nicely on leash, he knows the words sit, stay, come, down, leave it, wait and in (to go into his crate at bedtime). 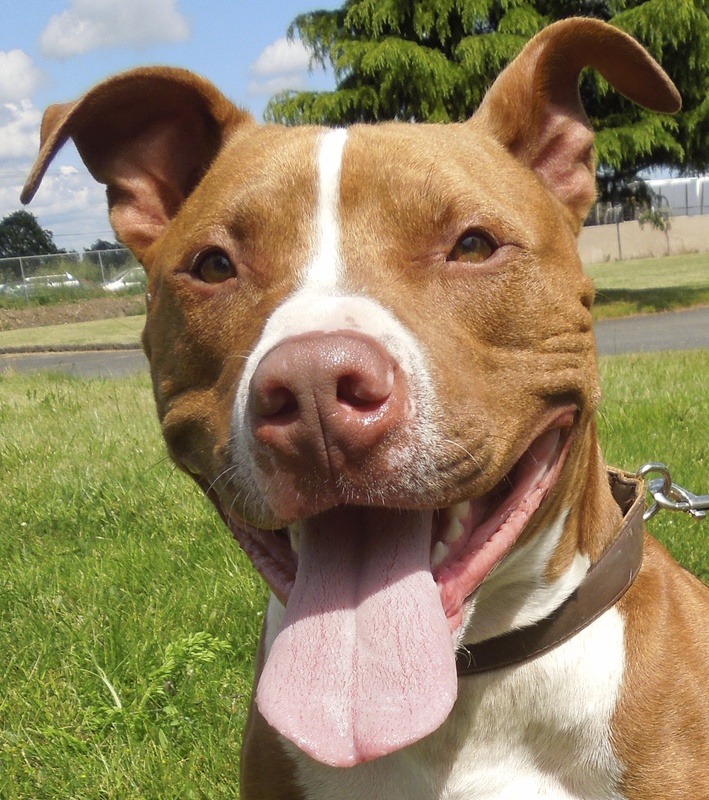 If you are interested in meeting Gilbert, call Alix, the Foster Coordinator at (503) 585-5900 ext. 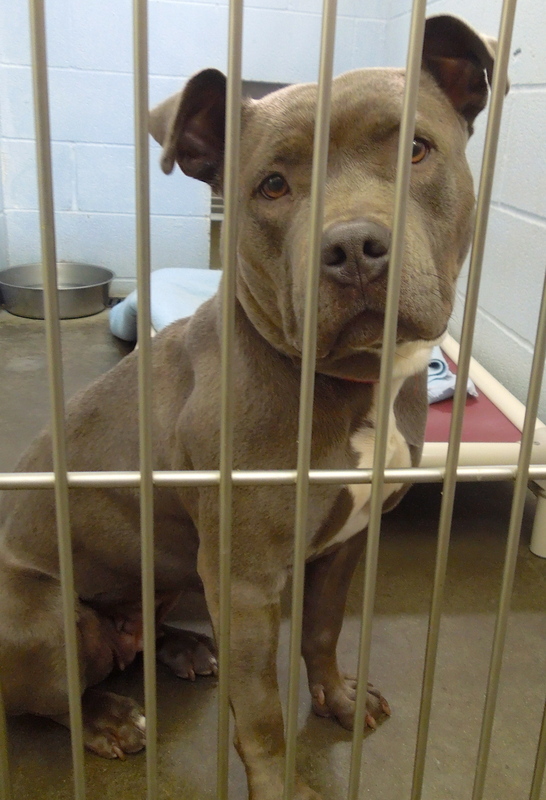 303, or email her at foster@whs4pets.org. 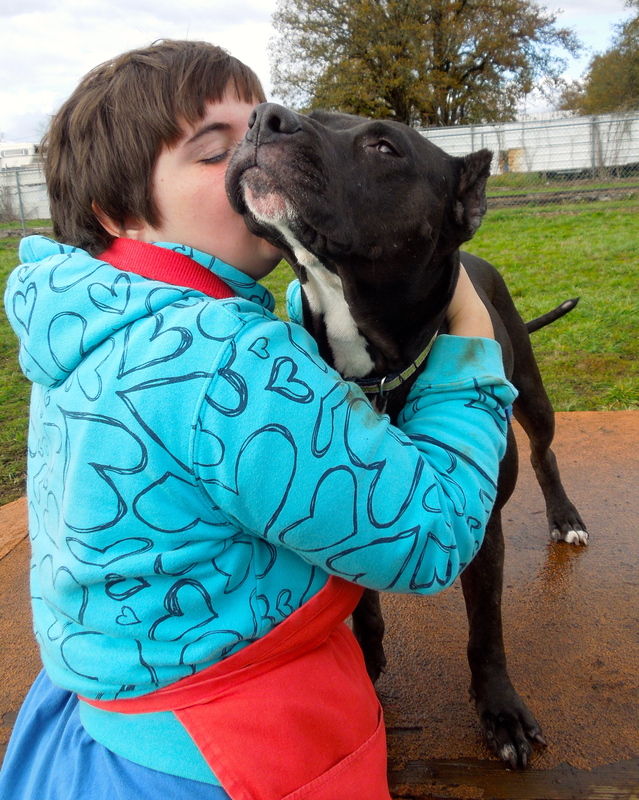 Gilbert has waited such a long time and deserves to finally have a home of his own. And here is my favorite picture of this very good boy! 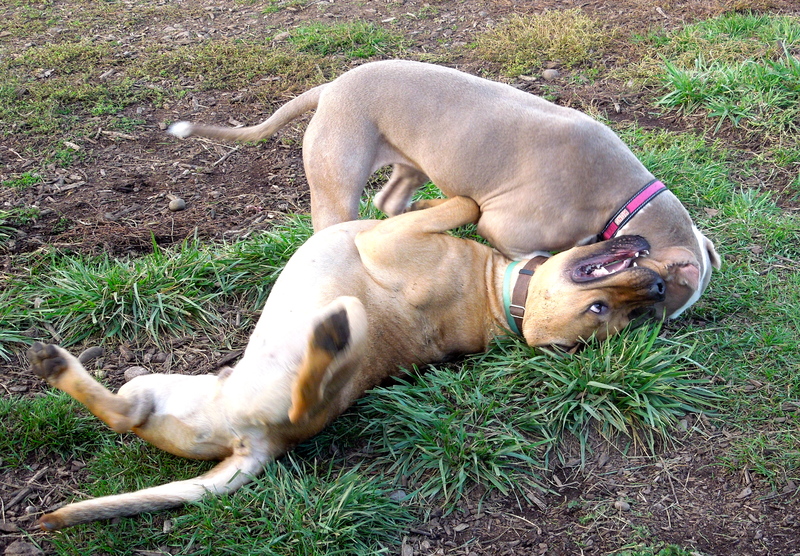 Best Friends Forever Play Date! 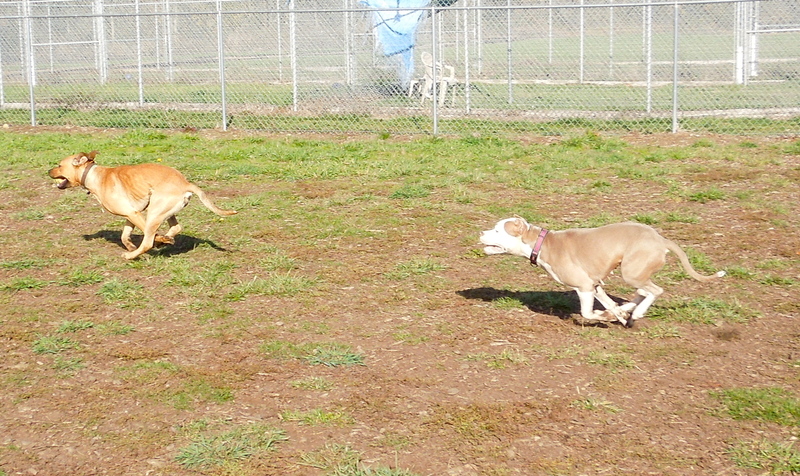 After all of the dogs had been walked this afternoon, Emelynn and I took Jax and Faye out for a 45-minute play date. I’m not sure who had more fun—Jax and Faye romping or Emelynn and I watching. First came the non-stop chase game. 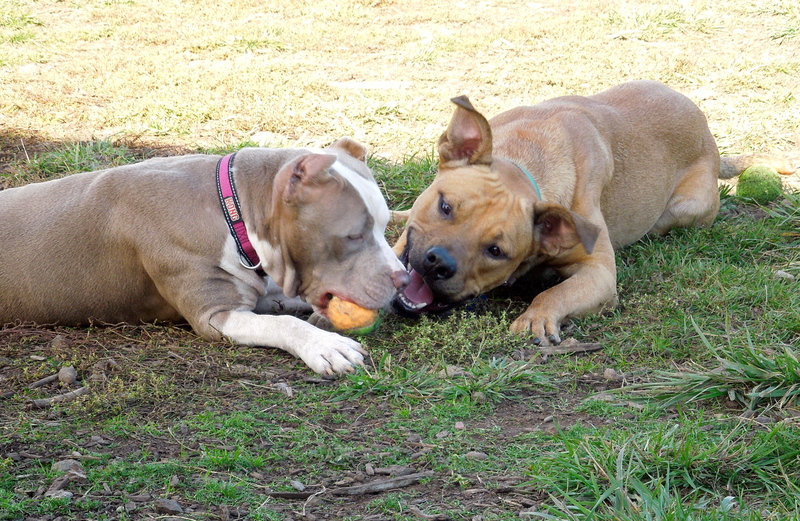 And then suddenly they decided to share a tennis ball. 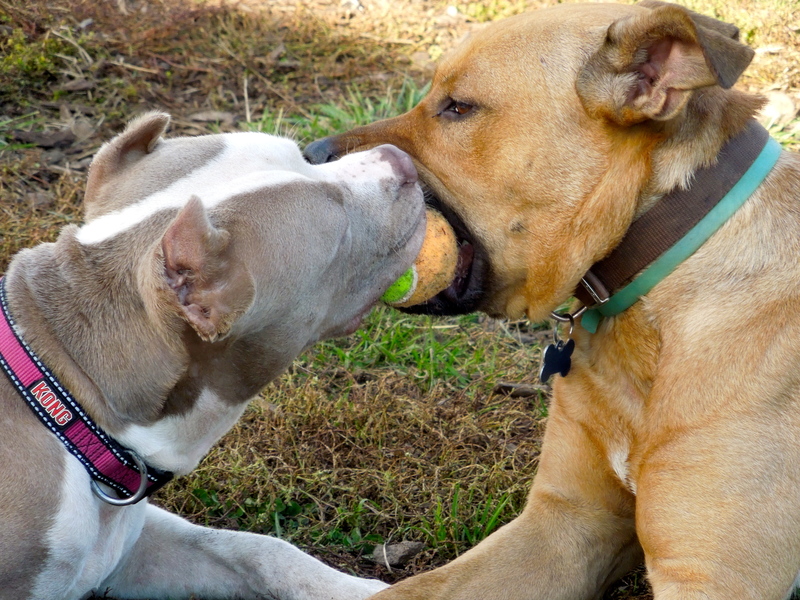 For about fifteen minutes they played a gentle tug-of war with it. 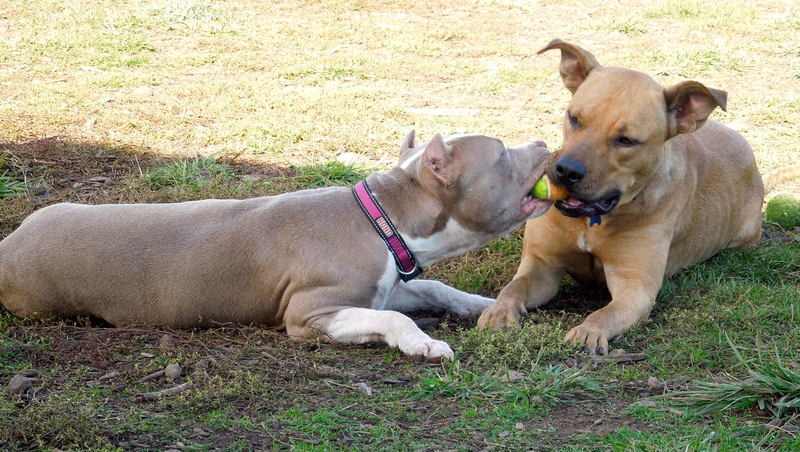 They took turns letting each other have the ball. It was such a sweet thing to watch. And then it was time to go in. 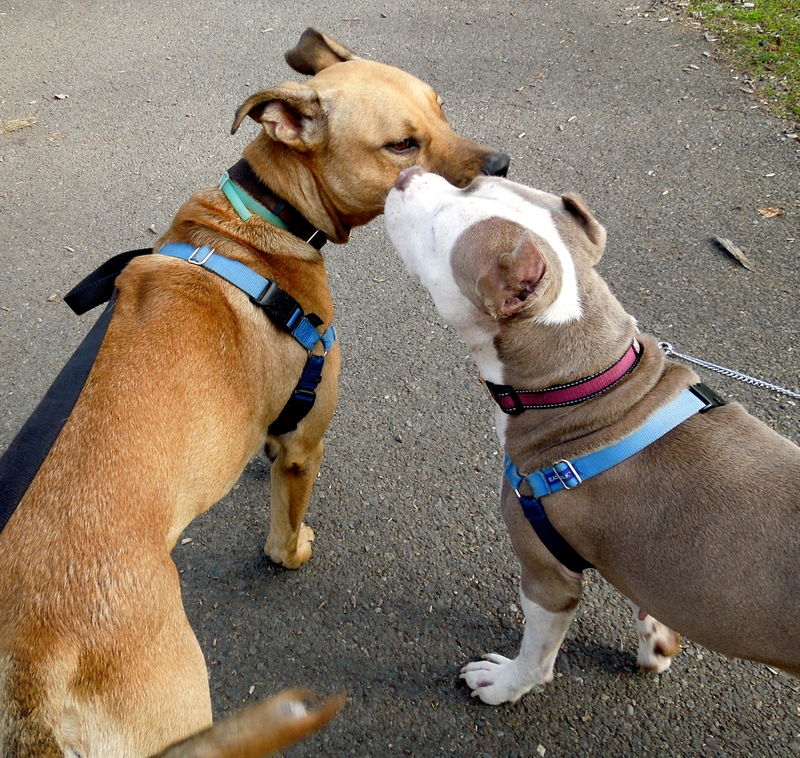 The BFF’s said goodbye to each other and headed back to their kennels. 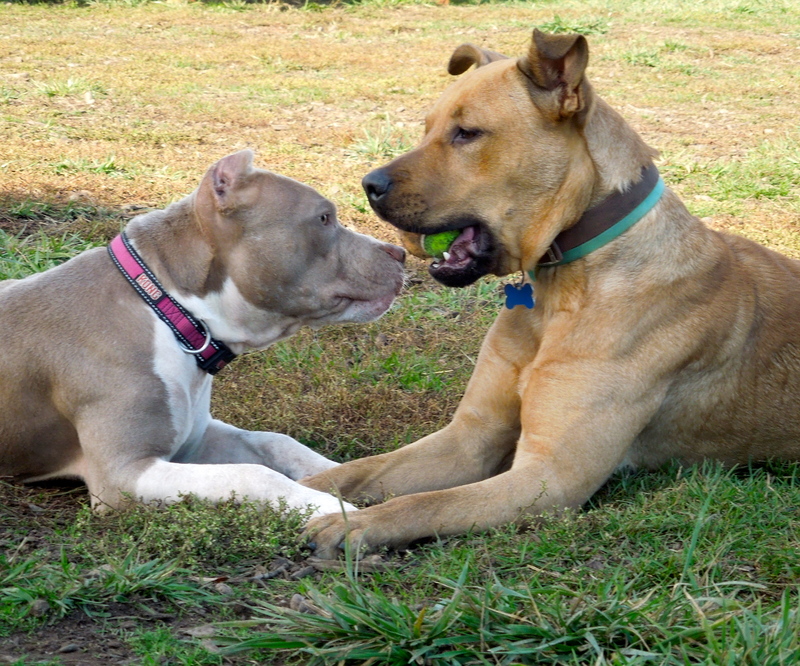 I wish these two wonderful dogs could be adopted very soon by friends so they could still have play dates. 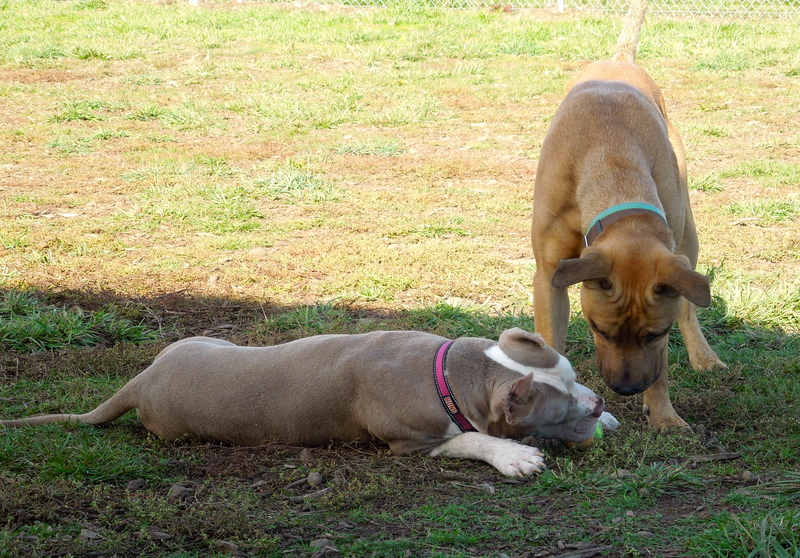 I so loved seeing Jax and Faye on their play date. What fun! Thanks for creating these memories. Loved seeing all the costumes again, and Jax and Faye playing so great. Is spanky still available ?